Peace in Kenya, New Years in February and a Baby Rhino named Annan ..
President Mwai Kibaki of Kenya (L), and Raila Odinga prepared to sign a deal on Thursday in Nairobi. After 2 months of bitter violence and intense drama, Kenyans turned a corner — from Power-Grabbing to Power-Sharing, old-guard Mwai Kibaki and opposition aspirant Raila Odinga decided to bury the hatchet on February 28. 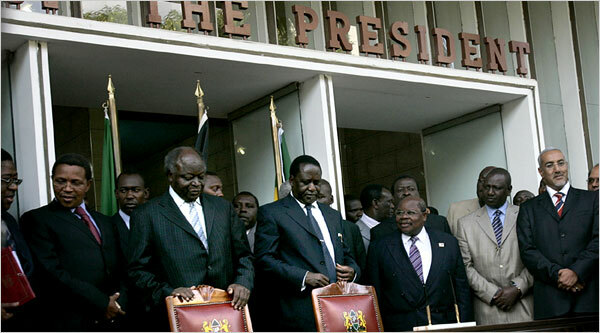 Interestingly enough, all credit goes to Mr. Kofi Annan who brought Kenya back from the brink of anarchy and despair. Annan, it seems understood how critical Kenya is to regional stability and the U.N mission in Africa — Kenya is a hub for peacekeepers to Sudan, Somalia, Rwanda and is a key port for most of East and Central Africa. In the past, he has come under heavy criticism for the U.N’s lethargic response to Darfur and was determined not to let this one get away. To honor the ex-UN chief and to show their gratitude Rangers at the Ol Choro Oirogua Conservancy in the Maasai Mara reserve named their new-born rhinoceros Kofi Annan . Kenyan’s all agree that this is a fragile peace and a number of concrete steps need to take place for there to be a lasting solution – nevertheless a new constitution diluting the powers of the president is a reasonable start. On a lighter note, there are delayed New Years celebrations all throughout the Kenyan capital as most residents felt that their new year was tarnished by the unrest and had nothing to celebrate.